Welcome the rebirth of our legendary and very fast H-1-9 blade. 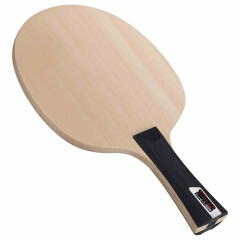 The fabrication of this famous one-ply Hinoki wood blade has been completely revised. It is now a thoroughly modern table tennis blade due to the adaptation of the shape and weight. The results enhance the very favourable characteristics making this a very fast and hard offensive blade.The H-1-9 design is now available in a choice of all grip types. Tibhar Blade H-1-9 is beeing added to cart.